Freshmen and faculty of the new comedic arts program. Once her parents were fast asleep, seven-year-old Hannah Cairo would creep out of her room, tip-toe downstairs, and snuggle onto the couch in front of the television to sneak a peek at Saturday Night Live. She became obsessed, watching clips whenever she could get the chance. She would spend the next decade of her life performing, preparing for a career in the field of humor. Now, she’s one of the first students in the nation to major in comedy. 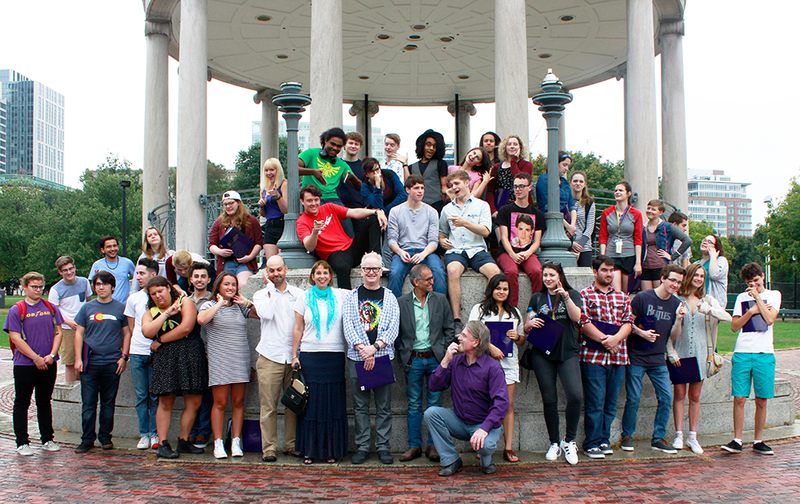 With the start of Emerson’s fall 2016 semester comes the inaugural class of the Comedic arts Bachelor of Fine Arts. The degree focuses on three main components of comedy– writing, performance, and production. Students in the program are required to study all three until they pick a specialty junior year. Martie Cook, the director of the comedic arts department, said that the new major teaches comedy as an artform with vast historical and cultural influences, and pulls courses from the visual and media arts department. “You can’t write or produce good comedy if you don’t have a background in liberal arts,” Cook said. The evolution of comedy on campus began back in 1976 with the creation of the college’s first troupe, Emerson Comedy Workshop, by now-famous alum Dennis Leary. Since then, many groups have sprouted on Boylston, with about 10 troupes ranging from improv to sketch to short films. This major is a formal recognition of students’ interests, and it hopes to tap into and enhance young artists’ curiosity and studies, Cook said. Cook said the initial goal for the program was to get around 24 students enrolled. Between all the new applicants and returning students looking to switch in, they currently have approximately 42. More are still switching in and out, so Cook said she can’t give a solid number just yet. For Fendt, it means the opportunity to expand her education beyond performance and into writing. For fellow comedic arts student, Molly Zalman, it means self-validation. Zalman, a sophomore, came to Emerson as a visual and media arts major, but switched into the new program this year. Zalman said that despite her switch in major making perfect sense to her and her parents, her sisters like to poke fun at the comedy degree, jokingly suggesting that she become a chiropractor instead. Professor Michael Bent teaches Fundamentals of Comedic Story-Telling, a required first-level course, and said that if anyone can make a risky program like this successful, it’s Emerson. Fendt said she’s considering combining psychology and humor, particularly when it comes to helping patients in hospitals cope. Zalman is also interested in the healing power of jokes and whether laughter really is the best medicine, she said. “I love how when you sit down with someone, laughter is always going to happen.” Zalman said. “The way and why people laugh is very interesting to me. Why do you find something funny and I find something else funny?" Zalman said she’s excited to explore these questions in Theories of Humor and Laughter, a required course about what makes things funny. Ideas like these about psychology seem to be popular amongst the comedy students; Noa Johnson, a freshman in the program, said she also likes humor because of the emotions it evokes. “We live in a world where a lot of awful things happen and comedy is something that brings awareness to those things, but it can also provide relief from all of those feelings,” Johnson said. This theme of emotional relief and expression is exactly why Cairo also considers comedy an important art form, she said. Cairo said after spending her life performing various genres with all sorts of people, she’s most excited to finally focus on what she loves with a group of fellow humor fans.